Cleverly Created With Perfect Proportions! 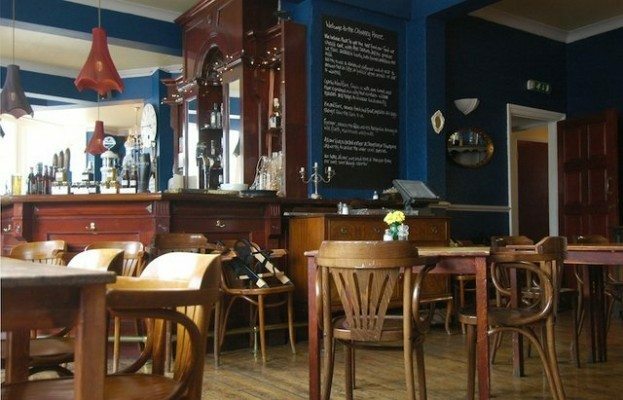 Located just a short walk from Seven Dials, the Chimney House offers something for everyone from a cup of tea and a slice of cake, pint of Harveys, glass of prosecco, a cheeky little bar snack or a relaxed three course meal. They do their utmost to source all their ingredients from local suppliers – something that is still so important to the passionate foodies of Brighton. My partner and I were asked to go along one Wednesday evening to sample their burger. Having not visited the place for quite some time we jumped at the chance! From the outside the building looks big and welcoming with large windows that allow you a view of the restaurant and beyond into the open kitchen. Once inside you are greeted by the large original bar in the centre. To one side is a more traditional bar area with comfy seating and to the other is the restaurant and open kitchen. 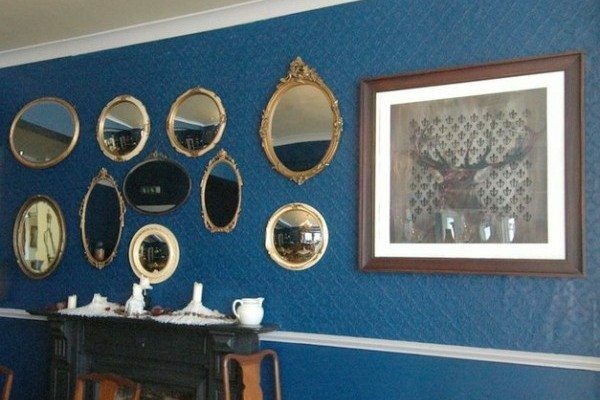 The whole place has a real homely feel with dark blue walls, stag horn lampshade and antique mirrors and pictures adorning the walls – it’s a real contrast to the view into the contempary open kitchen where Chef Charlie and his team can be seen hard at work. We’d been asked to go along and try their Dirty Little Burger (priced at a very reasonable £4.00) from their bar snack menu that runs during food service times only. 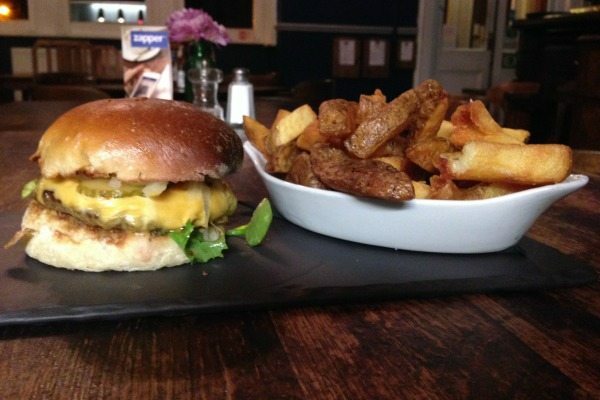 The burger consisted of a 35 day aged beef patty, onions, gherkins, tomato sauce and English mustard in a homemade brioche bun. Worried that a burger priced at £4.00 would not satisfy our appetites we also opted for chips each as well (£4.00). They were served to us on a black slate with the chips in a large bowl (one bowl each), and we were immediately blown away by the amount of food that had been served. The burger, although smaller than your average burger was perfectly in proportion to the ratio of bun and patty, with the fillings oozing from the sides. The flavours of the gherkins, mustard and tomato really came through. Rather than large slices of onions and greenery, everything was on a smaller scale to match with the onions being diced and small leaves were used instead – genius! 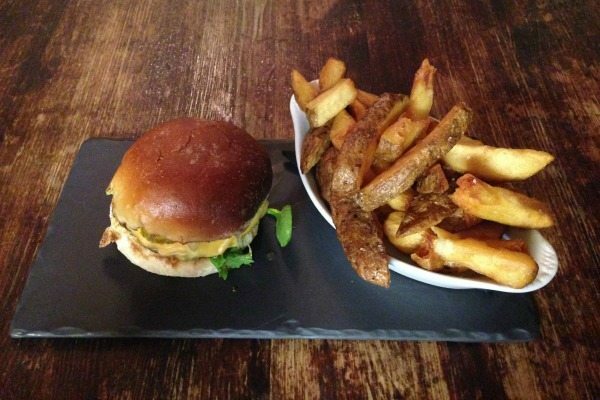 The burger was delicious, and being small was very easy and clean to eat – no embarrassing drips here. The chips were also superb, although too many for me. They were wonderfully chunky with a good crunch and lightly seasoned. So often chips arrived that are so salty I can’t eat them. If this is the kind of food that Charlie and his team can offer at grand total of £8.00 each, then I cannot wait to come back and try the full menu – I have a feeling that I won’t be disappointed. Toppings (flavours, uniqueness, chemistry with meat and bun): 8 The flavours all worked very well and we liked that fact that even the onions and salad came in miniature. I have to say though that the combination of gherkin, mustard and tomato sauce in the burger had me reminiscing of the days when I thought McDonalds were ok for you!! Bun (toasting, density, freshness and durability): 7 My partner really enjoyed his bun and thought that it held together well and was toasted nicely. My bun was possibly over toasted on one side and I found mine quite dry towards the end. It might just be because I took my time eating though! Accessories (presentation, taste, seasoning and condiments) 7 There were no accessories as it is just a bar snack. However, it was presented well and is amazing value at just £4.00.